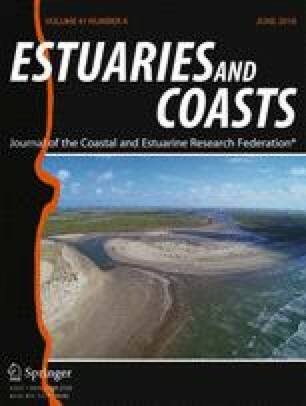 Estuaries are important subcomponents of the coastal ocean, but knowledge about the temporal and spatial variability of their carbonate chemistry, as well as their contribution to coastal and global carbon fluxes, are limited. In the present study, we measured the temporal and spatial variability of biogeochemical parameters in a saltmarsh estuary in Southern California, the San Dieguito Lagoon (SDL). We also estimated the flux of dissolved inorganic carbon (DIC) and total organic carbon (TOC) to the adjacent coastal ocean over diel and seasonal timescales. The combined net flux of DIC and TOC (FDIC + TOC) to the ocean during outgoing tides ranged from − 1.8±0.5 × 103 to 9.5±0.7 × 103 mol C h−1 during baseline conditions. Based on these fluxes, a rough estimate of the net annual export of DIC and TOC totaled 10±4 × 106 mol C year−1. Following a major rain event (36 mm rain in 3 days), FDIC + TOC increased and reached values as high as 29.0 ± 0.7 × 103 mol C h−1. Assuming a hypothetical scenario of three similar storm events in a year, our annual net flux estimate more than doubled to 25 ± 4 × 106 mol C year−1. These findings highlight the importance of assessing coastal carbon fluxes on different timescales and incorporating event scale variations in these assessments. Furthermore, for most of the observations elevated levels of total alkalinity (TA) and pH were observed at the estuary mouth relative to the coastal ocean. This suggests that SDL partly buffers against acidification of adjacent coastal surface waters, although the spatial extent of this buffering is likely small. The online version of this article ( https://doi.org/10.1007/s12237-017-0345-8) contains supplementary material, which is available to authorized users. The authors would like to acknowledge support from NSF (OCE 12-55042; AJA) and Norsk Vannforening (Norwegian Water Association; MLP) and everyone that helped with sample collection including Alyssa Finlay, Angel Ruacho, Camille Grimaldi, Evan Betzler, Madeleine Harvey, Margot White, and Michael Fong. The authors would like to thank Sara Rivera and Brandon Stephens for help with TOC sample analysis. The authors would also like to acknowledge the San Dieguito Joint River Park Authorities, Park Rangers and the San Diego Coast Keepers for allowing this study to be done. Finally, we would like to thank Kyle Mandla, Madeleine Harvey, Theo Kindeberg and Travis Courtney for helpful feedback on the manuscript. Comments by two anonymous reviewers also significantly improved an earlier version of this manuscript. Abril, G., M.V. Commarieu, D. Maro, M. Fontugne, F. Guerin, and H. Etcheber. 2004. A massive dissolved inorganic carbon release at spring tide in a highly turbid estuary. Geophysical Research Letters 31 (9): L09316. https://doi.org/10.1029/2004GL019714. Aitkenhead-Peterson, J.A., J.E. Alexander, and T.A. Clair. 2005. Dissolved organic carbon and dissolved organic nitrogen export from forested watersheds in Nova Scotia: identifying controlling factors. Global Biogeochemical Cycles 19 (4): GB4016. https://doi.org/10.1029/2004GB002438. Alin, S.R., R.A. Feely, A.G. Dickson, J.M. Hernández-Ayón, L.W. Juranek, M.D. Ohman, and R. Goericke. 2012. Robust empirical relationships for estimating the carbonate system in the southern California current system and application to CalCOFI hydrographic cruise data (2005-2011). Journal of Geophysical Research: Oceans 117: n/a, C5. https://doi.org/10.1029/2011JC007511. Bouillon, S., F. Dehairs, B. Velimirov, G. Abril, and A.V. Borges. 2007. Dynamics of organic and inorganic carbon across contiguous mangrove and seagrass systems (Gazi Bay, Kenya). Journal of Geophysical Research 112 (G2): G02018. https://doi.org/10.1029/2006JG000325. Cai, W.-J., A.W. Wang, and Y. Wang. 2003a. The role of marsh-dominated heterotrophic continental margins in transport of CO2 between the atmosphere, the land-sea interface and the ocean. Geophysical Research Letters 30 (16): 1849. https://doi.org/10.1029/2003GL017633. Dittmar, T., N. Hertkorn, G. Kattner, and R.J. Lara. 2006. Mangroves, a major source of dissolved organic carbon to the oceans. Global Biogeochemical Cycles 20: GB1012. https://doi.org/10.1029/2005GB002570. Friis, K., A. Körtzinger, and D.W.R. Wallace. 2003. The salinity normalization of marine inorganic carbon chemistry data. Geophysical Research Letters 30 (2): 1085. https://doi.org/10.1029/2002GL015898. Guo, X., M. Dai, W. Zhai, W.-J. Cai, and B. Chen. 2009. CO2flux and seasonal variability in a large subtropical estuarine system, the Pearl River Estuary, China. Journal of Geophysical Research 114 (G3): G03013. https://doi.org/10.1029/2008JG000905. Hélie, J.-F., C. Hillaire-Marcel, and B. Rondeau. 2002. Seasonal changes in the sources and fluxes of dissolved inorganic carbon through the St. Lawrence River—isotopic and chemical constraint. Chemical Geology 186: 117–138. https://doi.org/10.1016/S0009-2541(01)00417-X. Hofmann, G.E., J.E. Smith, K.S. Johnson, U. Send, L.A. Levin, F. Micheli, A. Paytan, N.N. Price, B. Peterson, Y. Takeshita, P.G. Matson, E.D. Crook, K.J. Kroeker, M.C. Gambi, E.B. Rivest, C.A. Frieder, P.C. Yu, T.R. Martz, and W.-C. Chin. 2011. High-frequency dynamics of ocean pH: A multi-ecosystem comparison. PLoS ONE 6 (12): e28983. https://doi.org/10.1371/journal.pone.0028983. Hu, X., and W.-J. Cai. 2011. An assessment of ocean margin anaerobic processes on oceanic alkalinity budget. Global Biogeochemical Cycles 25 (3): GB3003. https://doi.org/10.1029/2010GB003859. Laruelle, G.G., H.H. Dürr, C.P. Slomp, and A.V. Borges. 2010. Evaluation of sinks and sources of CO2 in the global coastal ocean using a spatially-explicit typology of estuaries and continental shelves. Geophysical Research Letters 37 (15): L15607. https://doi.org/10.1029/2010GL043691. Maher, D.T., and B.D. Eyre. 2012. Carbon budgets for three autotrophic Australian estuaries: implications for global estimates of the coastal air-water CO2flux. Global Biogeochemical Cycles 26 (1): GB1032. https://doi.org/10.1029/2011GB004075. Moore, W.S., J.O. Blanton, and S.B. Joye. 2006. Estimates of flushing times, submarine groundwater discharge, and nutrient fluxes to Okatee Estuary, South Carolina. Journal of Geophysical Research 111 (C9): C09006. https://doi.org/10.1029/2005JC003041. Robinson, C., B. Gibbes, H. Carey, and L. Li. 2007. Salt-freshwater dynamics in a subterranean estuary over a spring-neap tidal cycle. Journal of Geophysical Research 112 (C9): C09007. https://doi.org/10.1029/2006JC003888. Wang, S.R., D. Di Iorio, W.-J. Cai, and C.S. Hopkinson. 2017. Inorganic carbon and oxygen dynamics in a marsh-dominated estuary. Limnology and Oceanography. https://doi.org/10.1002/lno.10614. Yao, H., and X. Hu. 2017. Responses of carbonate system and CO2 flux to extended drought and intense flooding in a semiarid subtropical estuary. Limnology and Oceanography. https://doi.org/10.1002/lno.10646. Young, A.P., P.N. Adams, W.C. O'Reilly, R.E. Flick, and R.T. Guza. 2011. Coastal cliff ground motions from local ocean swell and infragravity waves in southern California. Journal of Geophysical Research 116: C09007. https://doi.org/10.1029/2011JC007175. Zemmelink, H.J., H.A. Slagter, C. van Slooten, J. Snoek, B. Heusinkveld, J. Elbers, N.J. Bink, W. Klaassen, C.J.M. Philippart, and H.J.W. de Baar. 2009. Primary production and eddy correlation measurements of CO2 exchange over an intertidal estuary. Geophysical Research Letters 36 (19): L19606. https://doi.org/10.1029/2009GL039285.